Make your dream come true with this ASW 17! It is a very smart glider which is appropriate for competition flying, and due to its proportion it is an excellent choice for GPS triangle flight. We computed a modern and thin airfoil which is perfectly suited for distance and speed flying. Circling, whether in strong or in weak thermal lift, is easy, and the model immediately speeds up with reflex, without loosing much height. 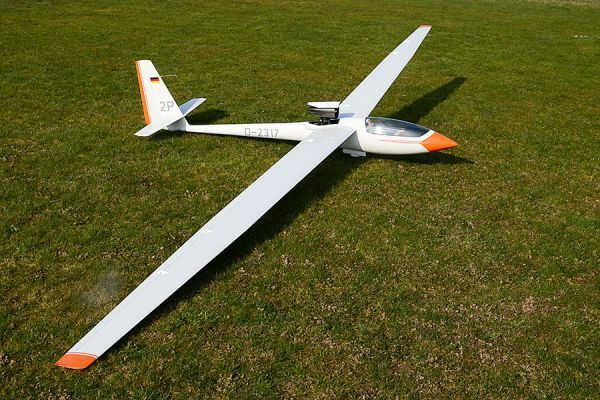 The mass of the glider is 16 kg, and with 3 kg of optional ballast a wing loading of 115 g/sqm can be reached. By reason of the thin airfoil the wings are built in an all carbon hard shell technique. Hence their surface is very sturdy, it is almost impossible to dent it. They are joined by a square wing joiner of dimensions 20x50 mm which is made of carbon, too. The outboard wing panels are joined to the inner panels by 10x20 mm carbon joiners. Related links to "FW ASW-17 1:3 full composite kit"